Barbed words and heated accusations are quietly dismissed by both parties for an undisclosed sum. Remember EA and Zynga's dispute over The Ville? 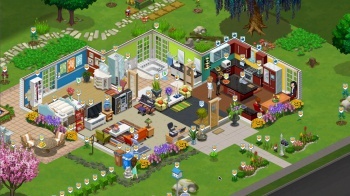 EA filed copyright violation claims over The Ville's close resemblance to EA's The Sims Social, and Zynga snapped back with a counter-claim, accusing EA of conducting anti-competitive practices and restraining its own employees from leaving the company, which included several executives. It appears that all the drama has come to a head with a bit of a whimper: both claims have since been dismissed. Official court documents state that both parties were ready to dismiss all claims and counterclaims "with prejudice", and that both parties will bear their own costs over the course of legal proceedings. EA's lawsuit stemmed from accusations that Zynga's The Ville had "design choices, animations, visual arrangements and character motions and actions" that were lifted directly from The Sims Social so as to be "largely indistinguishable". Maxis General Manager Lucy Bradshaw previously called it a "case of principle", and hoped that the case would prevent similar cases of creative infringement. In response, Zynga filed a counter-suit, claiming that EA's complaint was "an unrestrained ramble of immaterial, inflammatory, and prejudicial allegations". The company also alleged that EA attempted to slow Zynga's hiring process and force it to spend more money in litigation. An official Zynga statement received by Gamasutra plainly states that "EA and Zynga have resolved their respective claims and have reached a settlement of their litigation in the Northern District of California." Presumably there was an out-of-court settlement involved, but the amount was not disclosed to the public.